The intersection of newer financial tools and technology is creating an enormous impact that can help unleash a sustainable development revolution. How can a new fintech-based initiative connect with this sweet spot? The Fourth Industrial Revolution (4IR) is rushing towards us probably faster than we think. Despite the fact that we are still on the fringes of this revolution, one can somewhat visualize how gradually technology will shape our daily lives, the labour market, businesses and governments. However, it is yet to be seen how the 4IR will kick-off a revolution for inclusive growth and sustainable development. Blockchain is one technology that will revolutionize how financial transactions are done. Blockchain is already becoming hugely relevant to how banks will carry out international settlements, transfers and trade finance—to name but a few. Blockchain’s ability to simplify complex processes, their verification and record-keeping is a huge turning point for cross-border transactions. The financial markets are no doubt looking to embrace blockchain as early as they can. Leveraging the 4IR will be key to inclusive growth and taking sustainable development to where it is needed the most. It is high time to explore how blockchain will facilitate internationally funded development projects, especially in developing economies. It has a huge potential for efficiently managing various stakeholders and parties in complex, cross-border projects, especially those involving public-private partnerships. Such projects would include large infrastructure and power projects where multiple private investors, multilateral development finance institutions, and governments are involved in various phases of the projects. Newer financial tools like blended finance are encouraging sustainable development. As blended finance and other tools mature and are used more often, transactions involving large projects will inevitably get more complex—increasing transaction costs and causing delays—if not supported by technology. 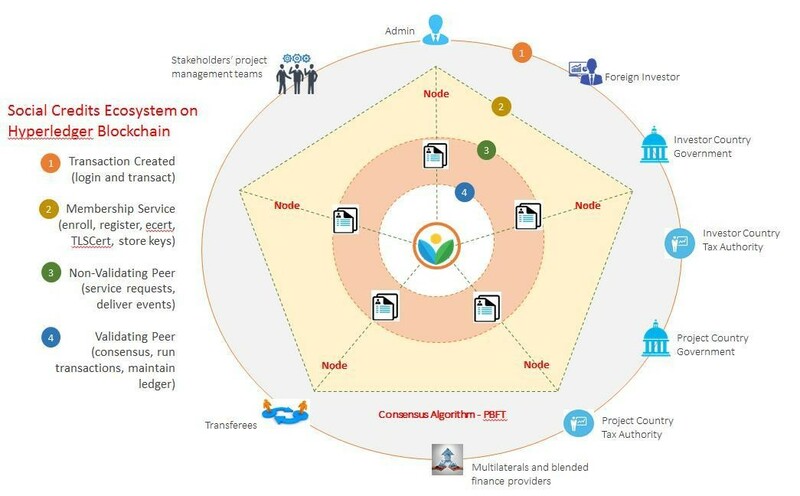 Blockchain-enabled platforms and processes can seamlessly manage a wide range of stakeholders working in different capacities on different projects across continents. It will increase efficiency, reducing transaction and make climate-related, infrastructure and other sustainable development more attractive for private investments. 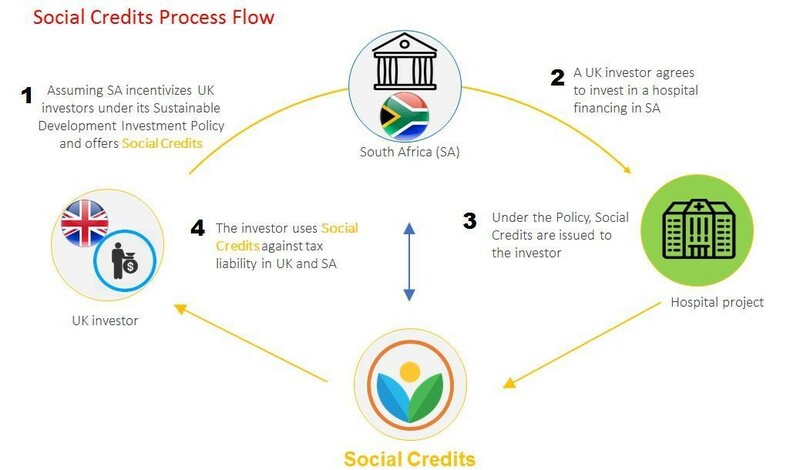 Social Credits are an incentive mechanism to mobilize private investment for sustainable development and growth (the process is illustrated in the chart below). It is also a formal initiative of the Forum of Young Global Leaders (YGLs). While working on this idea with a group of YGLs and other friends, we realized that the processes involved would likely grow more complex as the mechanism scales up—negating the very essence of an innovative solution to kick-start a wider adoption of private capital for sustainable development. In other words, if multiple countries, their tax and other authorities, multilateral development finance institutions, private investors and project contractors were to be part of a process, it would be highly cumbersome to manage all the stakeholders efficiently. Presented with this challenge, we decided to run the above processes on a blockchain platform to offer a scalable ecosystem for all stakeholders. Not only that a blockchain platform would offer trust and security, the processes would also run seamlessly and with real-time replication of the transactions across nodes of all stakeholders. We also realized that a blockchain-based distributed ledger would be low maintenance, highly secure and immutable. To achieve all of this and more, we decided to go for a Hyperledger-based blockchain solution to run and manage all the Social Credits processes. Let’s assume that the UK and South Africa agree on a clear policy to use Social Credits as a tool to harness private investments. The policy provides additional incentives to UK investors to invest in South Africa’s health sector. Each of the countries and the investors know in advance the applicable terms, the quantity and the (tax-adjustable) value of Social Credits to be issued. Both countries will have planned and budgeted for the quantity of Social Credits to be issued and the financial impact of their anticipated redemption. As a result of the incentive policy, a UK investor invests $100m to finance five hospitals in South Africa. Based on the agreed mechanism, South Africa issues to the investor 10,000 Social Credits that are valued at $100,000. The investor happens to have $30,000 tax liability in South Africa and $70,000 in the UK. After meeting the applicable terms and conditions, the investor is able to offsets its liability in both South Africa and the UK. Appropriate oversight processes are in place to avoid any unanticipated effect on the public finance of any country, and to protect the process from any abuse. We expect that a large volume of Social Credits in circulation will provide basis for them to serve as an alternative currency in a closed network, a true digital currency for sustainable development. Thanks to the support from Infosys and Microsoft Azure, the prototype of Social Credits Hyperledger is now ready. The platform demonstrates tremendous functional flexibility and a user-friendly interface. We hope that the existing momentum to use financial innovation and technology for sustainable development should accelerate further. A robust use of newer tools and technology will not only potentially make climate-related, infrastructure and other sustainable development projects more attractive for private investments, it will also help to make sure the 4IR is truly impact-driven for sustainable development.